A home for wildlife. Clear, cold mountain streams. Scenic beauty and places to get away. Opportunities to hunt, fish, hike and camp. Oregon's forests provide us with many treasures — treasures that Oregon Wild is working to protect and preserve. Oregon's forests define the rugged character of our state. From the unspoiled roadless wildlands of the Siskiyous, the Blue Mountains and Hells Canyon, to the towering old-growth conifer trees of the Cascade Range, our forests are an important part of what makes our state a special place to live, work, and raise a family. 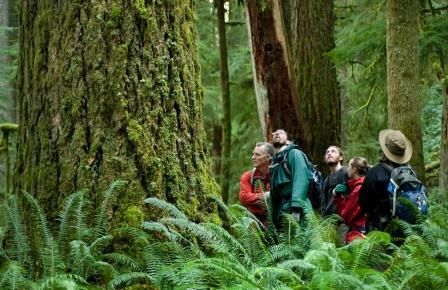 Unfortunately, Oregon's forests are facing increasing pressure from logging and development. Special interests are seeking to open roadless areas to clear-cut logging and some logging interests continue to target our last old-growth forests. Worse, the drive to allow logging and development in these pristine areas is diverting time and resources away from other important activities — such as protecting our communities from forest fires and promoting a vision for meeting our timber needs without harming the environment. The good news is Oregon Wild has provided a common-sense voice for conservation and protection of our forests for 40 years and counting. Check out the Oregon Wild map gallery to get a lay of the land and find out where your favorite patch of old growth may be. Photos (top to bottom): Devil's Staircase forest (Tim Giraudier/Headwaters Photographic); Three Sisters cedars (Steve Hansen).